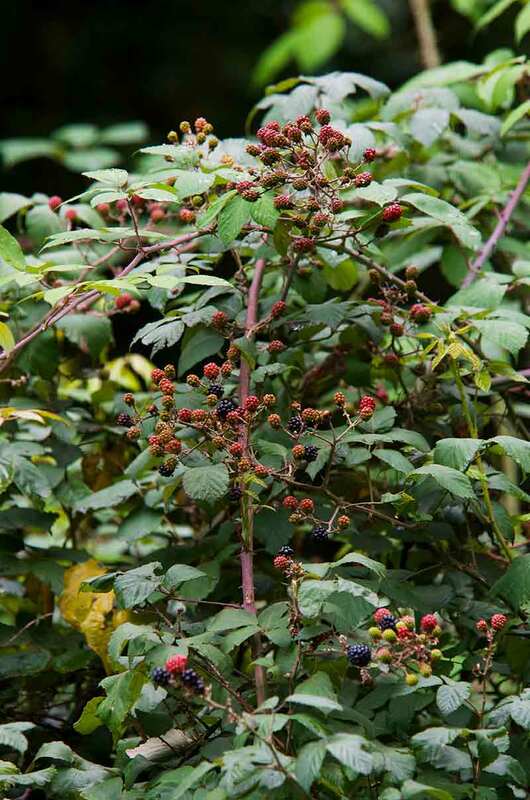 Wild blackberry fruit can be a welcome surprise when brambles make their way into your landscape, but when summer wanes and their fruit has passed, these fast-moving, thorny thickets become major headaches. Woody brush and vines, such as berry brambles and poison ivy, can be difficult to eradicate, but with the right approach, you can take back your landscape and put an end to their rambling threats. Tenacious brush and vines rely on several ways to take over new territory. Berry brambles spread from the base of the plant, known as the crown, where stems and roots meet at ground level, but they aren't limited to one type of growth. Brambles spread by arching, above-ground stems called canes and by underground stems, known as rhizomes, which can pop up to form new plants where you least expect them. New plants also form wherever cane tips touch the ground and root. Add the multitude of tiny seeds a mature, berry-covered bush produces — which are dispersed near and far by birds and wildlife — and you have a bramble explosion on your hands. Poison ivy and other tough brush and vines spread in much the same ways. Fighting on just one of those fronts can knock back berry bushes and slow their prickly advances, but the problem persists unless you do battle on all fronts. Some herbicides can help temporarily, but they work by killing only the plant parts they touch. Known as contact herbicides, they don't move through plants to reach other parts, such as the far-reaching roots on tough vines and brush. While most roots on wild blackberries stay near 1 1/2 feet deep, some can go down more than 6 feet. Poison ivy roots seldom go below 12 inches deep, but they can spread up to 20 feet wide below the surface, while their vines clamber up to the tops of trees. With tough, woody brush and vines, every part left untended means a repeat of the problem is in store. To control these plants effectively takes an herbicide that can move or "translocate" within the plant once it's absorbed by leaves, stems or other parts. Known as systemic herbicides, these brush-fighters work to leave no plant part untouched and meet brambles and itch-inducing ivies on every advancing front. Difficult woody plants and brush can be treated throughout the growing season, but your results may vary because of seasonal changes in the way these plants grow. Timing impacts success, so it helps to understand the plants involved and schedule treatments accordingly. Bramble treatments, for example, can be applied as soon as leaves fully open in spring, but the period between when fruit-bearing ends in midsummer and when leaves change color in fall is the time for optimal impact. Capitalizing on seasonal changes can improve results significantly. In blackberry brambles, spring and early summer find plant energy running from roots toward canes to feed and fuel new growth. However, that traffic pattern reverses in mid-to-late summer, when plants start sending sugars toward roots instead of away from them. Effective systemic herbicides follow these same pathways through the plant. The natural rootward flow that happens late in the growing season helps move treatments applied to leaves and stems through the plant to knock out waiting roots and rhizomes, too. As plants go dormant, internal movement slows and stops, so timely treatment is important. 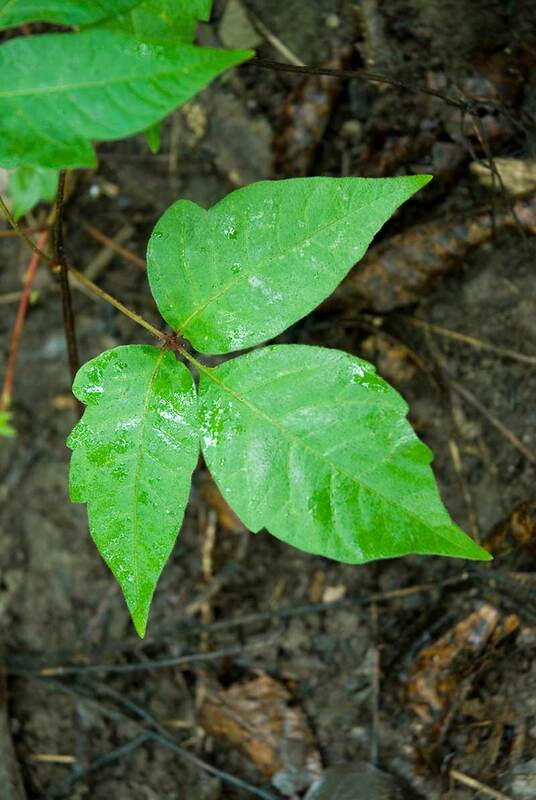 For poison ivy, applications can be made once the plant leafs out fully and its three-leaved leaflets can be clearly seen. But optimal treatments coincide with the time from summer flowering through the white fruit that appears in late summer and fall, when the plant's low energy reserves leave it vulnerable. As with brambles and other tough, woody vines, treat poison ivy while it's still actively growing, before it goes dormant for the year. The University of California Statewide Integrated Pest Management Program advises that herbicides with the active ingredient triclopyr can provide effective control over difficult brambles, as can the active ingredient glyphosate. The University of Georgia Extension includes herbicides with the same two active ingredients among its recommendations for eradicating poison ivy. Depending on your conditions, reapplications may be needed due to the extensive underground and aboveground growth these and other tough woody brush and vines present. Triclopyr-powered IMAGE Herbicide from Lilly Miller Brush & Vine Killer is a systemic herbicide that strikes the entire system of treated brush and vines. Used according to label instructions, it kills brambles, poison ivy and other difficult woody weed plants and allows for replanting the area one month after treatment. AMDRO Noxall Vegetation Killer with glyphosate is a systemic herbicide that controls treated plants and works to keep the area clear of all types of plants for up to one year. Both products are non-selective — they can kill both broadleaf and grassy plants, including lawn grasses and ornamentals — so follow label instructions carefully. Even though brambles, poison ivy and other weedy brush and vines can be tenacious, you can take them on with confidence, and make every ounce of your attack count. With IMAGE Herbicide from Lilly Miller and AMDRO on your side, you can break free from bramble invasions and itchy ivies, and get back to enjoying all of your landscape.